A 200th anniversary certainly is a reason to celebrate. 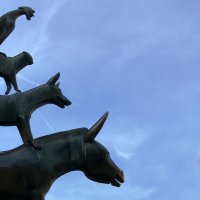 The story of the Bremen Town Musicians was first published in 1819 in the second edition of the Brothers Grimm’s Children’s and Household Tales. The book’s foreword is dated 3 July. 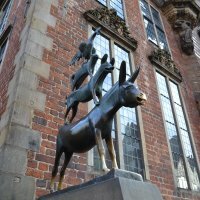 So at the start of July 2019, Bremen will be throwing a grand birthday bash for its four fairytale heroes. The highlight will be a packed anniversary programme lasting nearly one week that will take place in Bremen city centre and on the banks of the Weser river during the Breminale festival from 3 to 7 July. The programme kicks off with the Bremen Philharmonic Orchestra’s window concert on 3 July, when the musicians will be playing to the audience in the central cathedral square from the surrounding buildings. 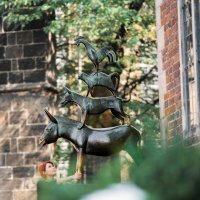 The Stadtmusik festival of street music begins immediately afterwards in honour of the Bremen Town Musicians. Until 6 July, it will see street musicians, bands, ensembles and many others playing on selected streets and squares in the city centre. The Musikantenmob follows on 6 July. 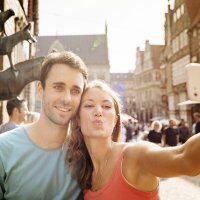 This flash mob-style event will feature bands that are taking part in the Breminale festival, members of the Bremen Philharmonic Orchestra and residents of Bremen, young and old. A mass cacophony of music is planned that will begin in the city centre and end at the Breminale festival on the banks of the Weser where the proverbial robbers’ house from the Grimm fairytale will be pulled down!